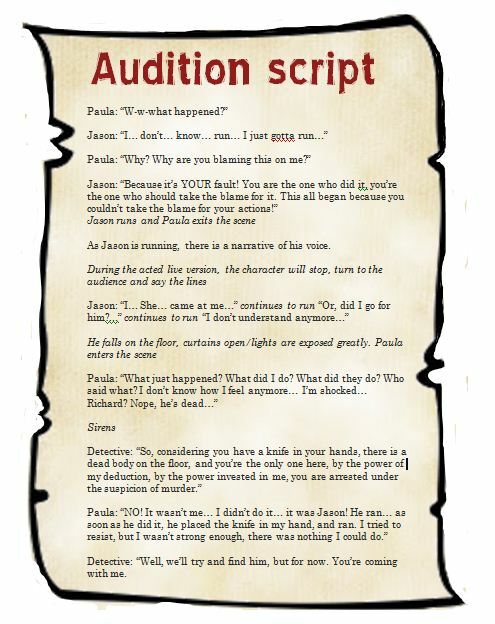 Here is the script we will be giving to people when they audition for a role in our film. The conversation is between Paula, Jason and the detective. The two roles are for Jason and Paula and we will see who plays the roles the best and then make a decision on who we want in the film. The script was written by Ed Mitchell but the design and script picture was designed by myself. This entry was posted on Thursday, November 22nd, 2012 at 6:19 pm	and posted in Uncategorized. You can follow any responses to this entry through the RSS 2.0 feed. Beautifully presented. It is difficult to read though when zoomed in.